The Peregrine Falcons are back! 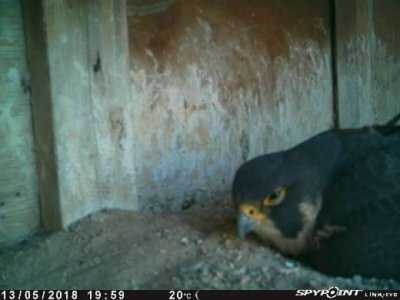 This year the Saskatchewan Cooperative Falcon Project installed a camera beside the nesting box. The female, Andamooka, laid 3 eggs on May 5. The incubation period is 30 days. Before anyone gets their hopes up, it is a trail cam, not a webcam and it only catches part of Andamooka & Jasper as they are incubating - enough so the folks monitoring the nest have some idea of what they are looking at though! Yep, I actually edited the post on Twitter to read as camera, not trail camera. My excitement lies with the fact that they are incubating. Excitement is a great thing and Regina used to have a camera back in the 1990s I think so maybe this year’s trailcam might be the first step on the road to getting a public cam again - even if it is just a CCTV to the lobby (think they had that too way back when). New camera tech and providers like YouTube Live have made a huge difference for small projects like both Sask’s and ours who likewise have small budgets to work with. One advantage is that nesting on City Hall means that there may be a potential for a great partnership. My fingers are crossed - and when I’m chatting with the Project next I’ll offer to be a resource if they want to look at getting a public cam in the future. And you are right Allikat it would be nice to watch Andamooka and Jasper in action. It's great to see that Jasper & Andamooka are back again! Thank you for sharing this good news, Allikat. Great news! I haven't wandered downtown yet to see them this year. That is excellent news! I am very happy for Andamooka and Jasper! I’m so happy to hear they’re doing well! Hopefully all four chicks will fledge successfully.